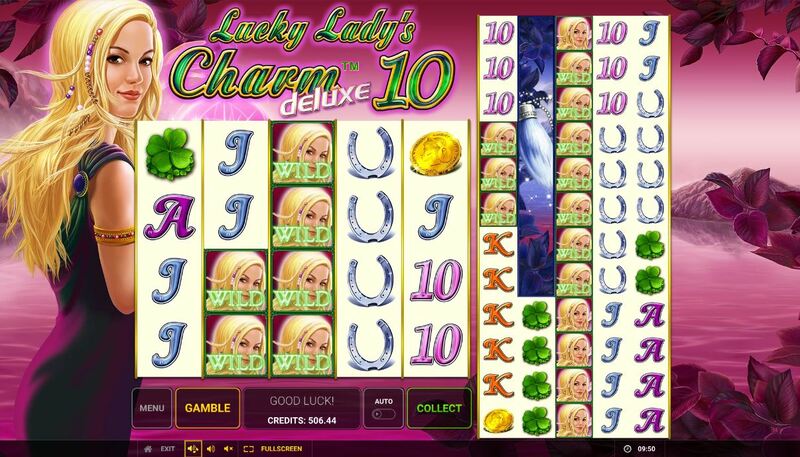 Lucky Lady's Charm Deluxe 10 slot needs no introduction for fans of slots, land-based or online. It's a classic case of 'If it ain't broke, don't fix it!' because that's exactly what Novomatic have done here. We all know Novo tend to tweak existing popular slots for example Book of Ra Magic with it's extra scatter symbols for retriggers and Book of Ra Deluxe 6 or Lucky Lady's Charm 6 with the added reel and different volatility. These are good variations and here of course we have the original theme of Lucky Lady's Charm Deluxe repeated with various symbols of good fortune on the reels plus the traditional music and honking noise when a scatter lands. Will this lady be any luckier for our bankroll than her little sister though? 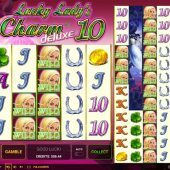 Lucky Lady's Charm Deluxe 10 slot I guarantee you will make you instantly think WMS and slots such as Kiss and Giants Gold. This is because if you've seen those Colossal Reels slots you'll know exactly how this game is going to work before even reading the pay tables! We have 100 lines over a 5x4 grid on the left and a 5x12 grid of colossal reels on the right. Symbols are stacked including the Wild in the form of the Lucky Lady which is the best 5-of-a-kind pay at 5x bet, Ladybird 5x, Rabbit's Tail 4x, Shamrock or Coin 2x, Horseshoe or Ace 1.5x with four lower card values at 1x. I probably don't need to point this out, but any stacked Wild on the smaller 4-row reels set on the left will replicate to the large reel set if appearing in full at 4 rows high. You'll be fortunate to see more than one but if you do this is where any value in the base game will lie. You will see the familiar pink Crystal Ball on reels 1, 3 and 5 on both sets. You can trigger 8 free games with any 3 in view and these can retrigger. The free games play out with the classic reveal animations where all the tiles on the grids are hidden with red starry covers and reveal the underlying icons as they turn. The enhancement is with the Wilds as now they don't have to appear fully-stacked on the small grid, but instead will expand over the whole reel if any part of them appears and then will replicate to the larger grid. Your best win is a full screen of Wilds at 500x bet.